Born in 1957 in Changhua, Taiwan, and a graduate from the National Taiwan Normal University Department of Art, Chang, Yung-Chung briefly taught at the arts and crafts department of National Hsinchu University of Education (now part of National Chunghua University) and art department of Taibei High School. Though he comes from an educational background, his adventurous spirit led him onto his path as a professional artist. From two-dimensional paintings, ink-wash installations, performance art, to cross-boundary art, some figurative, some abstract, the brand new attempts he makes in art, and diverse creativity stuns his audience time and time again. His work is not only recognized by the Provincial Exhibition, Taipei Arts Awards, Lion Art Newcomer Award, and first prize at the Taipei Fine Arts Museum 'New Horizons' and 'Abstract Exhibition' exhibitions, and collected by the Taipei Fine Arts Museum, National Taiwan Museum of Fine Arts, Kaohsiung Museum of Fine Arts, and private collectors, but also represented Taiwan in exhibitions in Hong Kong, Japan, South Korea, and France. Chang, Yung-Chung's artworks are strongly conceptual, thought-provoking, and cross-boundary. Though he was taught traditional academism, he does not limit himself to tradition, going on to forge a world of his own, soaring freely in the art world. His way of transforming traditional materials with artistic, zen, and poetic ideas show a unique new view of art that awes the viewer. 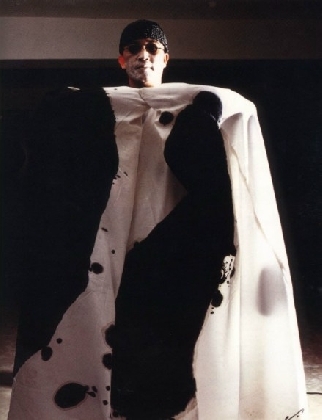 Some of his iconic pieces throughout his career include the "Cultural Leap", "Ink Transformation", "Abstract Energy", "Countryside", and "Performance Art" series. These work span across different fields of art expression, displaying his abundant imagination and creativity. For example, in this "Cultural Leap" series, he uses geometric shapes in different shades of blue to create a colorful urban imagery; In "Ink Transformation", he subverts traditional ink wash with abstract art, displaying his bold and robust ideas; The "Countryside Series", on the other hand, uses large block of color to reinterpret Taiwan's geography and culture with a natural flair. 2014National Taiwan Museum of Fine Arts "Biographies of the Assassins" exhibition, where his work "Extensive Landscape" entered the museum collection.